There's a lot of information out there, but it's scattered on multiple web pages and sites. Sometimes is just easier to sort, filter, and group data using Excel. 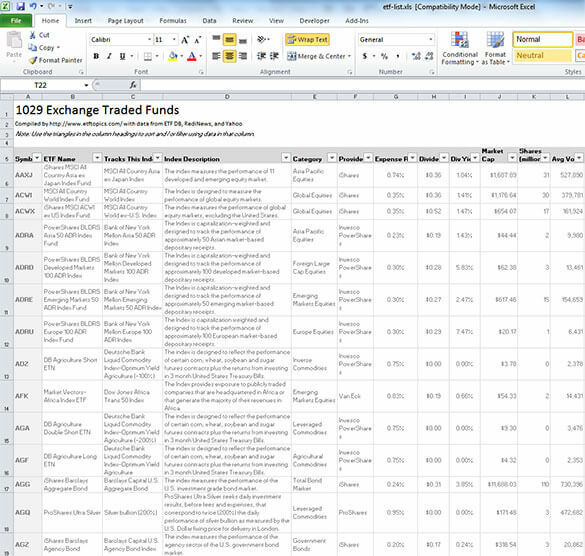 So I decided to compile a list of over 1,500 exchange traded funds all into a single Excel file to make it easier to pick and choose ETFs for additional research. If you want to skip all the verbiage, you can go straight to the download now (opens a new windows). For each ETF, the following data points are provided. If something useful is missing let me know. While the above is an exhaustive list of ETFs, here are the ETFs that I've looked into. Many of these are simply the ETF equivalents of index funds, but others are more exotic. In all cases what I write here isn't an endorsement. Everyone's situation is different and I don't presume to know what is right for anyone other than me. Your ETF download list is incomplete. For example, SPY is not included. Download file seems to have disappeared. Try reloading the page. Not sure why the link doesn't show for some people, but reloading seems to resolve the problem. Thank you for this. I joined the Google pus community reluctantly so I could download this. This is exactly what I was looking for.. Greatly appreciate this service!